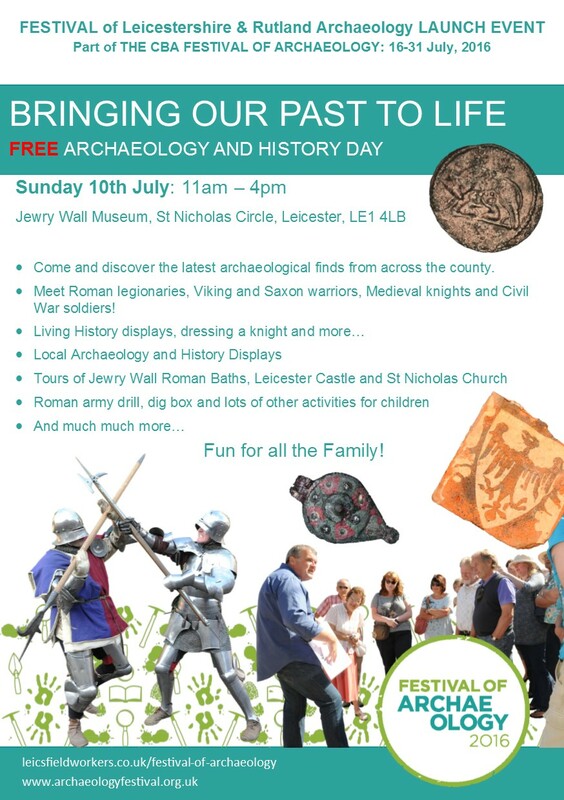 This year’s Festival of Archaeology kicks off with an exciting free family friendly event at Jewry Wall Museum in Leicester called ‘Bringing Our Past To Life’ on Sunday July 10th (11am-4pm). The event draws on the tradition of popular events at the Museum in the late 1980’s and 90’s that are fondly remembered by many visitors. There will be a chance to meet early and late Roman soldiers, Saxon and Viking warriors and craftspeople, Early and Late medieval people and Civil War musketeers and craftspeople. During the day an events arena will be busy with warriors fighting, parades of costumes through the ages and arming the knights, while living history displays will go on throughout the event. There will also be a chance to learn board and table games from the past. University of Leicester Archaeological Services archaeologists will be on hand to show visitors finds from recent excavations in the City and local archaeological groups will also be showing off finds that visitors can handle. The event is being held as a prelude to the main Festival of Archaeology that kicks off on July 16th and runs until July 31st. Over 70 events will be held across Leicestershire and Rutland – more than in any other area of the country – and these will be previewed at the launch event.